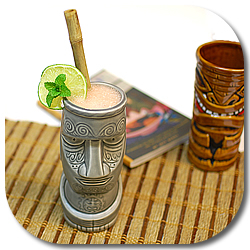 Shake all with ice and then pour – do not strain – into a Tiki mug or tall glass. Naturally the most appropriate chalice for this luscious libation is the eponymous mug for which it was designed (or would that make the drink the eponymous one? ), but if you don’t have one then really any Tiki mug will probably do. I, unfortunately, do not possess one but am accepting donations. As I was prepping for JB3 Week here at RumDood.com I spent some time doing intense research of the tippling kind by making a few of Jeff’s originals and asking other cocktail–inclined folk which Bum recipe was their favorite. The popularity contest was easily won by the Miehana with its light fruit flavors anchored nicely with a good rum. It’s also a drink that can stand up to a little tinkering, so if you want to swap out the Virgin Islands gold rum for something like El Dorado 15 or Smith & Cross, you can do so and get some wonderful results. Making it also gives you one of the few allowable excuses for owning commercial coconut rum (I kid, I kid…or do I? ), though it’s much more fun to make your own. What’s your favorite Jeff Berry original concoction? The big question here is: Which coconut rum does that rum-snob Dood use? My vote goes for the Cruzan Coconut, but I have to admit Malibu is the only other I’ve had. I don’t even know if there are more! Anyway, Jeff’s Coconaut is darn good for parties. Ah, the old magical backwards game. I’d like to bring up the Sorcerer in Fantasia’s Sorcerer’s Apprentice “Yen Sid” as my favorite of the phenomena. Also, Matt – Last I checked the Meihana mugs were thick on the ground – I don’t have my finger on the pulse of mug collecting, but are they some kind of rare now? I used this post as an excuse to try out the Coruba Coconut. It isn’t bad, though I still prefer homemade. I used Koko Kanu. A full strength, 40%abv rum – not a rum wanna-be like malibu. Had to swap out a golden Puerto Rican rum though for the Virgin Islands one though. I think it works fine though. I`ve yet to find a really good coconut rum and need all advice i can get. The best i`ve had may be Cruzan but its not good enough. I just drink my rum on the rocks with a squeeze of lime, but this drink does sound nice. The mug would be nice to have around too. Maybe it will inspire my orange trees to fruit a bit more. Wait a minute. Coruba makes a coconut rum AND YOU DIDN’T TELL ME? Friend fail. Rumdood is teh fired. Stella: I was once like you. Rum was only neat or on the rocks. Time and this crazy cocktail community now has me making cocktails most nights and sipping neat rums on special occasions. Marleigh: It’s not my fault! The Coruba flavored rums are fairly new and the bottles and labels are bloody awful. The coconut rum isn’t bad though. Next time you, Dan, Niki, and I get together I’ll have to remember to break it out. Marti Coconut (Coco Suave) rum is AWESOME, its 82.2 proof so it packs a punch. Its definitely my fav, but the problem is that its almost impossible to find. I got mine at Spec’s Midtown in Houston. How bout a recipe for homemade coconut rum, please? Already on top of it, Fitzmo! This is the only recipe I could find. I’ll be making it and posting about it soon, myself. Fitzmo: It’s in the queue, just need to make some more so that I can write it up. This sounds like a great drink. I am lacking in tiki mugs, but I’ll give this a try tonight nevertheless. Cheers! To answer your question, it does sound tropical. Its actually “Anaheim” spelled backwards and Anaheim (or rather Annaheim) means “house by the Santa Ana River” in German making this perhaps the only German influenced Tiki drink! Hello this is my first visit to your blog. I sooo love it! I’ve never had a miehana. I can’t wait to mix one (haha more 3) up! Thank you for the enlightenment, JasonK! I have been duped! LOL Nevertheless, my Mah EE hanas went over very well last Friday. It isn’t very often that I get to butcher something in Hawaiian (sp?) and English at the same time. I’ve had the Miehana mug for almost a year and this is the first time I’ve made the drink. Great stuff.